This Anacortes whale watching tour departs from Skyline Marina and cruises out through the San Juan Islands. Experience nature first hand with knowledgeable captains and naturalist guides, who have advanced degrees in biology, geology, and more. Great pride is taken in this fleet of small, high speed vessels with small groups - never carrying more than 30 passengers. The Blackfish fleet are the fastest in the region: the newest vessel the Blackfish III is the first marine ambulance in Washington state. On this Anacortes tour you will often pass by local landmarks including Cattle Pass Lighthouse, Lime Kiln Lighthouse, Deception Pass Bridge, Patos Island Lighthouse, and even venture as far as Victoria or Vancouver BC if it means seeing Orca. While traveling through the most beautiful scenery of the Pacific Northwest, search for orcas, humpbacks, grays, and more. You may encounter seals, porpoises, sea lions, otters, and more. Birds abound in our region as well. You will most likely see bald eagles, and frequently see common murres, black oystercatchers, rhinoceros auklets, surf scoters, ancient murrelets, and many diverse marine species. Occasionally you will find tufted puffins and even endangered marbled murrelets. Seasonally, hundreds of other bird species migrate through and overwinter in the Salish Sea. 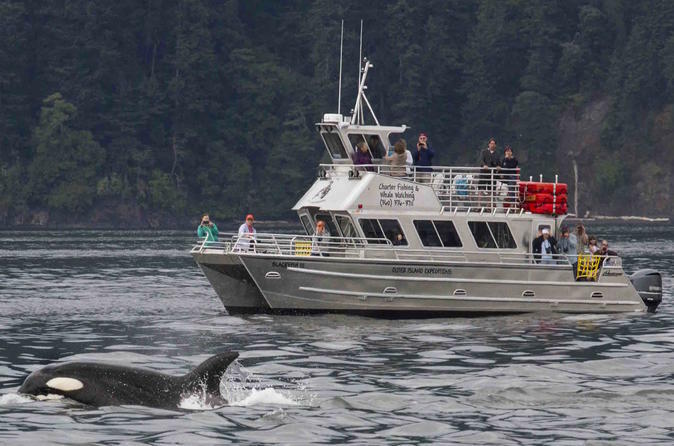 You are guaranteed whale sightings on tours from April through early September. In 2015 there was a 100% sighting success on over 1400 tours. We have the fastest boats so we can get to where the whales are, from Victoria to Vancouver and everywhere in between.